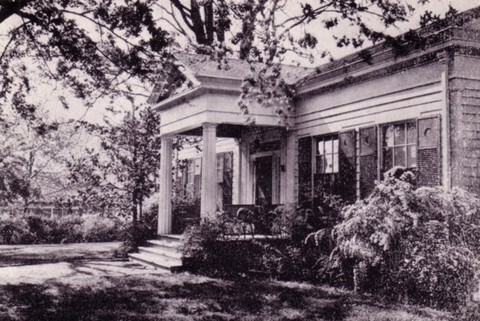 Headquarters House, 118 E. Dickson St., as it appeared about 1950. Today, it's owned by the Washington County Historical Society and used for historical programs. Also known as the Tebbetts House, this frame home with Greek revival design was built in 1853 by Matilda and Jonas March Tebbetts as their family home in Fayetteville. Its design was the same as the William Baxter House, which stood across Dickson Street at about the location of the Washington County Courthouse. Jonas Tebbetts was a lawyer and civic leader who owned land in Washington and Crawford counties. The Tebbettses sided with the Union when the state seceded, and Jonas Tebbetts was taken prisoner in early 1862 and held at Fort Smith for hanging. He was granted a reprieve and freedom not long after the general who had planned to have him hanged, Gen. Benjamin McCullough, was killed at the Battle of Pea Ridge. After release, the Tebbettses moved to St. Louis, Missouri, when conditions allowed for safe transit. During the war, the house was used at various times as headquarters by both Union and Confederate forces. It was at the center of the Battle of Fayetteville on April 18, 1863, when Confederate forces attacked the Union army, with the heaviest fighting occurring on the grounds in front of the house. The front door of Headquarters House sustained damage from mini-balls, and that door was later moved to an interior doorway to better preserve it. The house was designed and built by William Baxter with a central hall and matching wings to left and right. A brick smokehouse and hand-dug well still stand in the backyard. Since 1967, the house has served as headquarters for the Washington County Historical Society, which conducts tours and opens the house to visitors during its annual Ice Cream Social and commemorations of the Battle of Fayetteville. Many of the pieces of furniture in the house are from the Tebbetts family or from the period in which the family lived in Fayetteville. It is perhaps the most beautiful antebellum home still standing in Fayetteville. It was added to the National Register of Historic Places in 1971. In the 1980s, the law office of Archibald Yell was moved to the backyard of Headquarters House. Leflar, Helen Finger and Carolyn Lewis Newbern. Yesterdays: A Walk through the Washington-Willow Historic District. (Washington County Historical Society, Fayetteville: 1983). Lemke, Walter J. Some Old Fayetteville Homes (Fayetteville: 1951).